Greentech Fuel Saving Device is the only fuel saver product in the market which has been tested and approved by TUV, SGS, California Environmental Engineering (EPA and CARB certified lab), and UK National Grid by following the EPA standard and the SAE J1321 test standard. Our patented technology fuel saver can save up to 30% on fuel, lowers emissions by up to 90%, and increases horsepower and Torque at the same time for more than 10 years. Also, it can be fitted into all kinds of the vehicle including motorcycle, generator, car, bus, van, boat, etc with no need to modify the vehicle and will not affect the vehicle warranty, too. 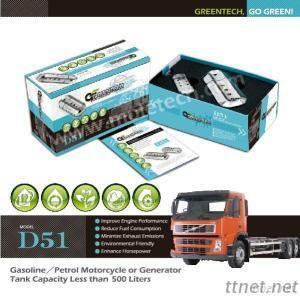 Auto Parts & Transportation, Auto Engine Parts, Auto Engine Parts/n.e.s.